Definition at line 119 of file regex2.h. Referenced by p_b_cclass(), p_b_eclass(), p_b_term(), and p_bracket(). Definition at line 121 of file regex2.h. Referenced by firstch(), freezeset(), nch(), and p_bracket(). Definition at line 120 of file regex2.h. Referenced by freeset(), and p_bracket(). Definition at line 163 of file regex2.h. Definition at line 47 of file regex2.h. Referenced by llvm_regcomp(), llvm_regexec(), and llvm_regfree(). Definition at line 134 of file regex2.h. Definition at line 122 of file regex2.h. Definition at line 124 of file regex2.h. 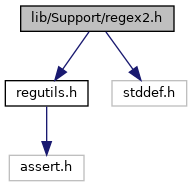 Definition at line 123 of file regex2.h. Definition at line 85 of file regex2.h. Referenced by p_ere_exp(), and p_simp_re(). Definition at line 95 of file regex2.h. Referenced by findmust(), p_ere(), p_ere_exp(), and repeat(). Definition at line 87 of file regex2.h. Referenced by p_ere_exp(), p_simp_re(), pluscount(), and repeat(). Definition at line 89 of file regex2.h. Referenced by findmust(), p_ere_exp(), and p_simp_re(). Definition at line 82 of file regex2.h. Definition at line 83 of file regex2.h. Definition at line 84 of file regex2.h. Definition at line 80 of file regex2.h. Referenced by p_bre(), and p_ere_exp(). Definition at line 96 of file regex2.h. Definition at line 92 of file regex2.h. Definition at line 79 of file regex2.h. Referenced by findmust(), and ordinary(). Definition at line 78 of file regex2.h. Referenced by findmust(), llvm_regcomp(), and pluscount(). Definition at line 81 of file regex2.h. Definition at line 97 of file regex2.h. Definition at line 90 of file regex2.h. Definition at line 93 of file regex2.h. Referenced by p_ere(), p_ere_exp(), and repeat(). Definition at line 94 of file regex2.h. Definition at line 73 of file regex2.h. Referenced by dofwd(), findmust(), instrumentMaskedLoadOrStore(), llvm::AsmPrinter::isBlockOnlyReachableByFallthrough(), llvm::LoopVectorizationCostModel::memoryInstructionCanBeWidened(), p_ere_exp(), p_simp_re(), pluscount(), and llvm::HexagonPacketizerList::undoChangedOffset(). Definition at line 71 of file regex2.h. Definition at line 86 of file regex2.h. Referenced by findmust(), p_ere_exp(), p_simp_re(), pluscount(), and repeat(). Definition at line 74 of file regex2.h. Definition at line 70 of file regex2.h. Definition at line 72 of file regex2.h. Referenced by doemit(), and dofwd(). Definition at line 88 of file regex2.h. Definition at line 91 of file regex2.h. Definition at line 162 of file regex2.h. Definition at line 147 of file regex2.h. Referenced by findmust(), llvm_regcomp(), llvm_regexec(), and pluscount(). Definition at line 75 of file regex2.h. Definition at line 145 of file regex2.h. Definition at line 146 of file regex2.h. Definition at line 127 of file regex2.h. Definition at line 68 of file regex2.h. Definition at line 69 of file regex2.h.